Reviewers are selected on the basis of their demonstrated competence and achievement as independent scientific investigators in relevant disciplines. Quality of research, publications, research grants, professional service, and other scientific achievements and honors are considered in selecting members. Most members have served on other bodies that review research proposals, such as NIH study sections and review committees of foundations and major health voluntary associations. Other qualifications include professional commitment, integrity, and ability to work effectively in a group setting. TRDRP has selected only highly respected investigators to serve on study sections. At the same time, TRDRP strives to bring in new and first time reviewers when and where applicable. 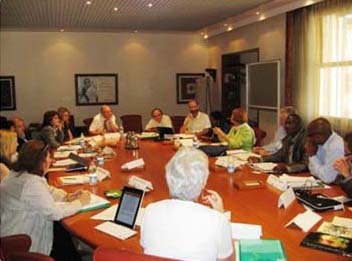 Review committee Chairs have, in addition to the above qualifications, substantial experience in both leadership roles (e.g., academic Department Head or Section Chief, or Laboratory Director) and research evaluation (e.g., service on NIH Councils or Advisory Boards, editorships of scholarly journals). Review committee members are chosen on an ad hoc basis and the specific individuals recruited for a given study section depend on the subject matter of the applications received in that cycle, i.e., review committees do not have a standing membership. Peer reviewers may serve a maximum of 4 consecutive years on one study section in the role of member. They must take a break in service of at least 2 consecutive years before being re-appointed. Peer reviewers may serve a maximum of 6 years on one study section in the role of member and chair. They must take a break in service of at least 2 consecutive years before being re-appointed. TRDRP uses scientific merit categories and rating scale similar to the 1-9 scale used by NIH. Scientific merit scores are assigned by reviewers after evaluating applications in relation to the specific criteria described above. Consistent with the NIH review procedure, once an application has been evaluated according to the appropriate criteria, the reviewer must decide whether it is of sufficient quality to be assigned a scientific merit rating or should be categorized as “Not Recommended for Further Consideration” (NRFC). NRFC means that an application lacks “significant and substantial” merit and does not justify a merit rating. Reviewers assign scores as whole numbers and base their rating on analysis of the proposed research in light of the review criteria. Reviewers are instructed to use the full range of scores. Applications are not compared with one another, but rather each is evaluated according to its potential for advancing the state of knowledge in its particular area. In contrast to the NIH system, TRDRP will not defer review of applications pending receipt of additional information. That is, rather than categorize such applications as “Deferred,” missing critical information should be cited in the written review as a specific weakness and a merit score (or NRFC designation) assigned based on the available information.